Shiv Sena MP from South Mumbai Arvind Sawant said he was “extremely pained” over the development. BJP ally Shiv Sena and opposition Congress and NCP on Friday reacted sharply to Prime Minister Narendra Modi’s photo in the calendar and the diary of Khadi and Village Industries Commission (KVIC). 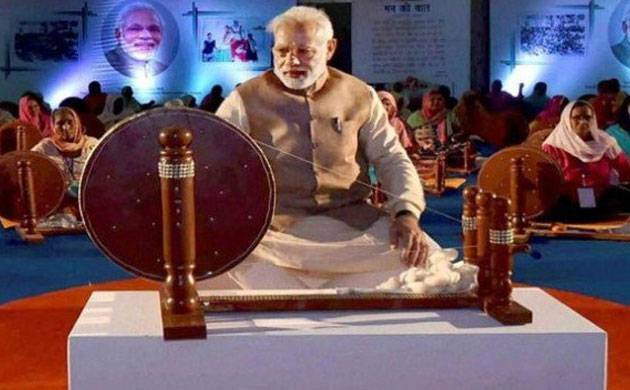 “Nobody would have objected if it was PM Modi’s photo spinning khadi on a charkha. What is objectionable is removing Mahatma Gandhi’s photos and placing his (Modi’s) instead. This is extremely painful,” he told reporters. “It is an example of what can happen when a person is self-centered and obsessed,” he said. Former Maharashtra Chief Minister and senior Congress leader Narayan Rane lashed out at the Prime Minister and said people will never forget the move. “Does he (Modi) think that by putting his pictures next to a charkha will make him a great figure or a ‘Mahatma’? He can never rise to Gandhiji’s status by doing such things,” Rane said. He added that after demonetisation, the Modi government has made life “miserable” for masses and that reality cannot be changed through such “gimmicks”. Senior NCP leader Ajit Pawar claimed it was Modi’s strategy to compare himself with great historical personalities. “Can anybody be compared with Gandhiji or Jyotiba Phule. Can there be a comparison with Mother Teresa? Because of her greatness, she was declared a saint,” Pawar said. NCP’s Mumbai women wing president Surekha Pednekar led a silent protest near Mahatma Gandhi’s statue at Nariman Point.